“Leafless” Pyrola: are they distinct species? There are a few species of Pyrola that appear to have ‘lost’ their leaves! Perhaps the best known example of this condition is Pyrola aphylla Sm.. Plants of this species have highly reduced, apetiolate leaves arranged in basal rosettes just where you’d expect them to be– at the base of each inflorescence! Well, most plants in Ericaceae, including Pyrola species, have symbiotic relationships with fungi– mycorrhizae! This symbiosis provides a dynamic method of nutrient exchange between plant and fungus. Both players bring something to the relationship: among other things, plants photosynthesize to produce carbon and fungi can break down nitrogenous compounds into forms that can be utilized by the plant. And in some Pyrola, this relationship has evolved in a strange way… Pyrola aphylla acquires carbon epi-parasitically, obtaining carbon from nearby tree species via a mycorrhizal fungus intermediate. Wow! The term for this is myco-heterotrophy. The ‘leafless’ condition has been observed in other species like Pyrola japonica var. subaphylla (Maxim.) Andres (an Asian species) and Pyrola chlorantha Sw. in North America. A few questions: (1.) Are plants with reduced leaves compensating for suboptimal light availability by using fungi and saving energy by not producing full-size leaves? Or, (2.) are these plants (actually ramets within a larger clone) simply conserving energy by making other ‘leafy’ plants do all the heavy lifting? Finally, (3.) it is possible that these plants with reduced leaves represent different species! 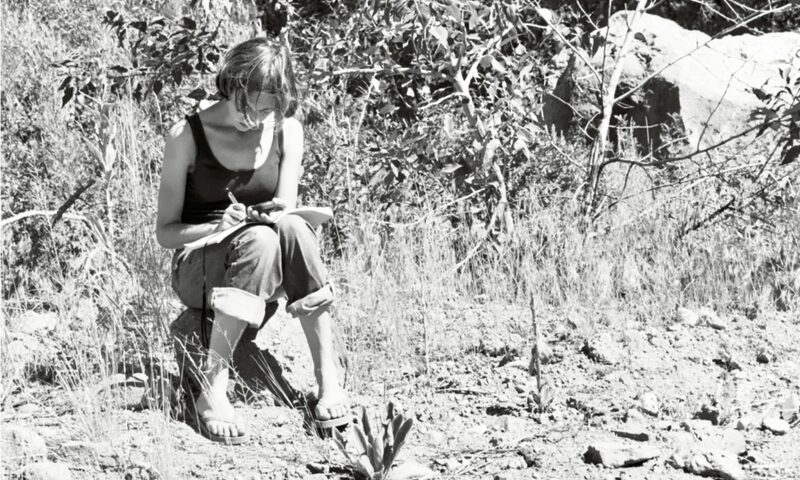 In 2012, I traveled to British Columbia collecting Pyrola for my research on the Pyrola picta species complex. While there, my colleagues and I explored the area around Anhuluut’ukwsim Laxmihl Angwinga’Asanskwhl Nisga’a. This area is also called Nisga’a Memorial Lava Bed Provincial Park. In this area we found the ‘leafless’ P. chlorantha, shown below in it’s habitat and compared with the ‘leafy’ P. chlorantha from a completely different area in southeastern Alaska. (A) Pyrola chlorantha observed near Nisga’a Memorial Lava Bed Provincial Park showing the distinct lack of expanded leaf laminae (but see chlorophyll in stem! 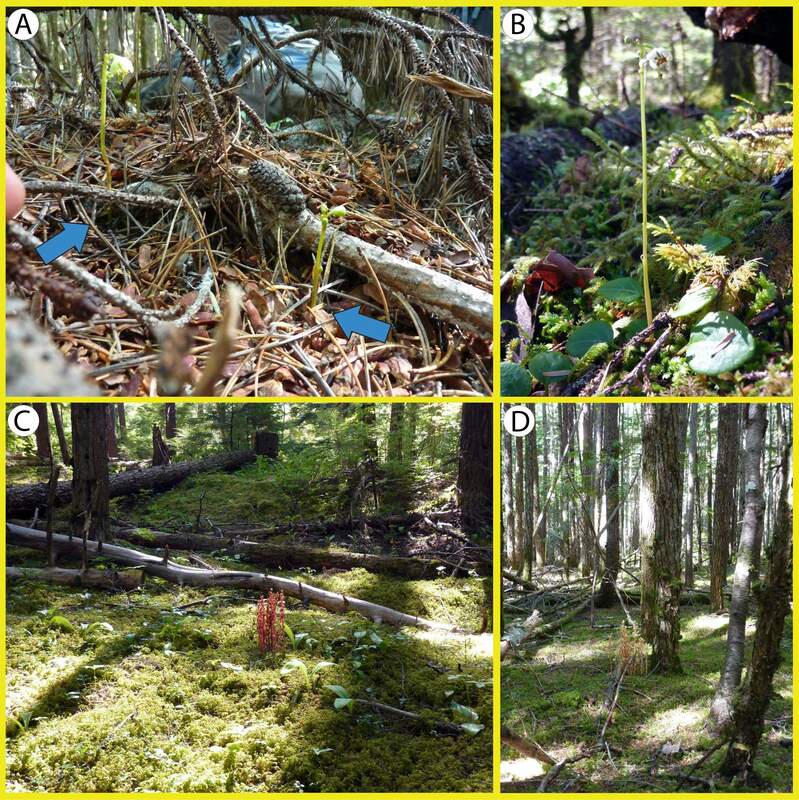 ), (B) P. chlorantha observed on the way to Herbert glacier north of Juneau, Alaska on the same trip, and (C, D) habitat of ‘leafless’ P. chlorantha shown in (A). Perhaps with some time and genetic analyses, we will learn more about this interesting form of P. chlorantha! I have been collecting tissues from these ‘leafless’ plants whenever I find them. My colleague, Zhen-Wen Liu (Kunming Institute of Botany), is studying this with Pyrola japonica and closely related species. It may be that this physiological transition to full myco-heterotrophy arises many times in genus Pyrola. Under what kinds of environmental conditions would this physiology be advantageous? Do you suppose there are any great costs to ‘losing’ leaves? Does the “leafless” Pyrola chlorantha have chlorophyll in its stem? It looked green in the picture, and the only reason I know for plants being green is the presence of chlorophyll. If this is so, it is possible that P. chlorantha still photosynthesizes, but that growing leaves to do so is an unnecessary expenditure of energy. I am thinking of striped maple, which performs photosynthesis in its bark as well as with leaves. Perhaps some plants abandon leaves altogether and just use stems, bark, or other organs to photosynthesize. After all, if a plant like a sundew or pitcher plant can use its leaves to catch insects, surely some plants would abandon leaves altogether and use some other part for the same purpose. Good idea! Yes, anywhere there are chloroplasts there can be photosynthesis happening. However, a stem is not the best way to catch light and this species grows in pretty dark habitats. Still, there it is– chlorophyll in the stem and parts of the flower, too.